The new era of touring boots seems to be focused on two things: simplified design, and strong downhill skiing performance. Removable tongues are mostly a thing of the past, and slick ski / walk modes are all the rage. And as their contribution to this category, Dynafit is releasing a new “Hoji” line of boots. 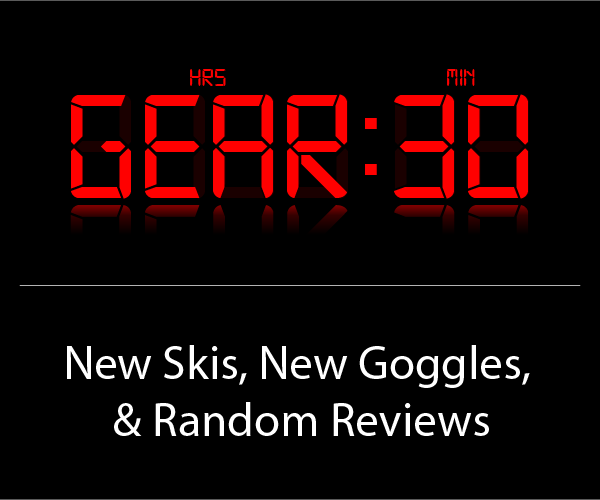 We talked pretty extensively with Eric Hjorleifson himself about the new boots on our GEAR:30 podcast, and that conversation is definitely worth a listen for more info on the origin of the project and the whole Hoji boot line. Since this review first went live, we’ve talked with Hoji again (twice, in fact), about the Hoji movie and also the newest addition to the Hoji boot line, the Hoji Free. David Steele in the Dynafit Hoji Pro Tour. 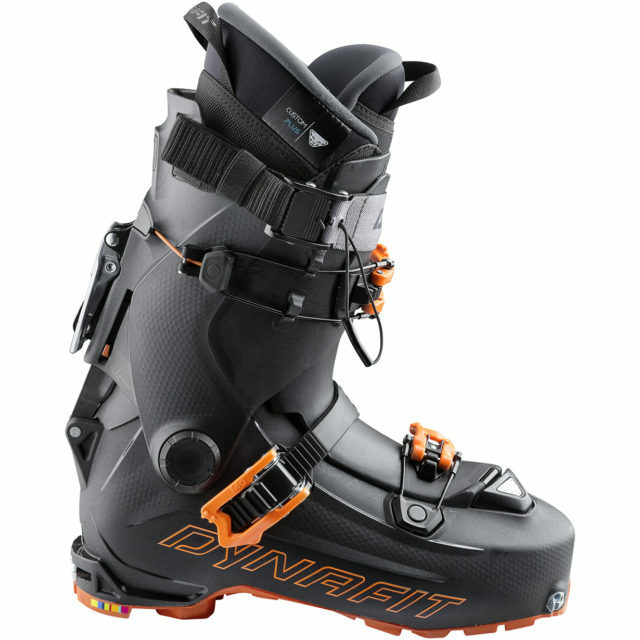 Dynafit, in their initial release, put out two big statements about the Hoji boots. 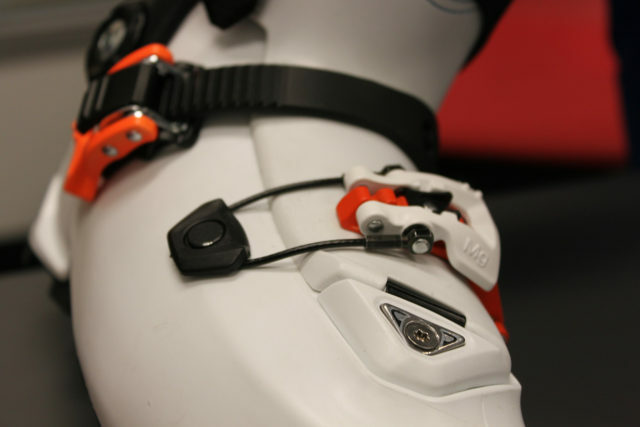 First, they state, “A ski touring boot geared more for the climb or for the descent? 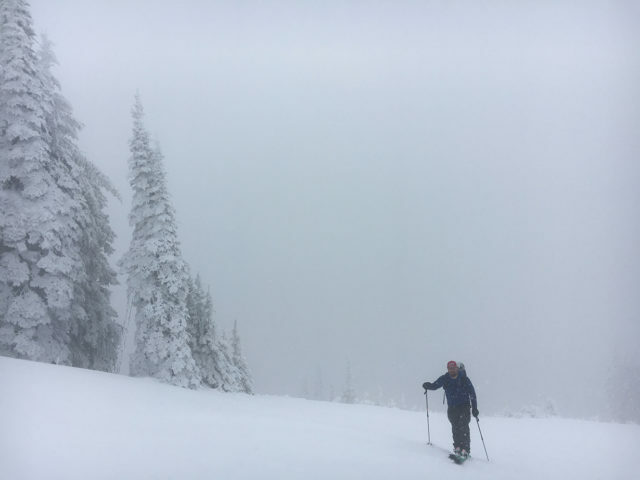 As of Winter 2018-19, this basic ski touring question will finally be a thing of the past because the Hoji touring boot has turned the question of ‘either-or’ into simply ‘and.’” So during my testing of the Hoji Pro Tour (the stiffest and lightest boot in the Hoji line), I’ve paid particular attention to the balance of the boot — is it more of an uphill-oriented boot, a burlier downhill boot, or truly both as Dynafit claims? So does the Hoji Pro Tour deliver on Dynafit’s claims? After getting four days in the pre-production boot and around twenty-six days and just shy of 50,000 ft of touring in the production version, here’s what I’ve found. The Hoji Pro Tour I tested first was slightly different than the production version that is on the shelves this year. I’ve now spent a lot of time in the production boot, and have detailed below the notable differences. The Hoji Pro Tour is very light, especially for a boot that’s supposed to ski like an alpine boot. The Hoji Pro Tour I tested is significantly lighter than the Atomic Hawx Ultra XTD 120, and also lighter than several of the 130-flex touring boots out there. As we always note in boot reviews, we believe that going to a good bootfitter is perhaps the best thing you can do to make skiing fun and comfortable. Because if your feet don’t fit well in the Hoji — or any other ski boot — no nifty new tech is going to make up for a poor-fitting, painful boot. As for me, I have wider, higher-volume feet, a high arch, and a high instep. And my feet work pretty well with the Hoji Pro Tour. Which is to say that it’s time for the wide-footed ski tourers of the world to rejoice — the stated interior last width of the Hoji Pro Tour is a remarkably roomy 103 mm, and it feels like it. In the preproduction version, I stuffed some higher-volume Superfeet Red insoles into my pair of the Hoji Pro Tour and was very happy right off the bat with overall volume around my toes (where I had room to wiggle them), as well as the room over my instep. To complement this, the Hoji Pro Tour has what feels like a medium-width heel pocket that fit snug on my larger feet. The production version of the Hoji fits tighter around the forefoot, in the arch, and also in the lower ankle. The new liner seems to be the reason for this, and it’s certainly more padded and beefier than the pre-production liner. I swapped my red Superfeet (high volume) for green Superfeet (medium volume), which still provides the arch support I want but gives me enough room in the production boot for a comfortable fit. For comparison, I didn’t punch or heat mold the Atomic Backland Carbon (stated last width 98 mm), and they unsurprisingly did not feel as roomy as the Hoji. The lower shells of the Dynafit TLT Speedfit and TLT6 (black and orange version) are also noticeably lower-volume than the Hoji. If you like narrower boots like the TLT5, early TLT6, or Salomon S/Lab X-Alp, you’ll probably find the Hoji Pro Tour to be much too roomy in the lower shell. While the lower shell of the Hoji is quite voluminous, the ankle and cuff are not. With my larger legs and calves, I found the calf area of the Hoji Pro Tour to feel more snug than most of the other touring boots I’ve used (e.g., Salomon MTN Explore, Salomon S/Lab X-Alp, Atomic Backland Carbon, Dynafit TLT6, and Dynafit Speedfit). And I noticed this when the Hoji Pro Tour was both buckled and unbuckled. Even after molding the production liner and fully breaking it in, I still wasn’t able to get the extra calf room I wanted. More on that below. A cable tightens the adjustable powerstrap. A cable tightens the upper cuff buckle. An internal sleeve in the cuff slides down and plugs the gap between lower shell and upper cuff, which determines the forward flex of the boot. A bar in the back of the upper cuff slides down, preventing the cuff from moving backward. All this means that, if you keep all your buckles at the same tightness on the up and down, then the only thing you need do to switch from going up to skiing down is flip the switch on the back of the boot. It’s that easy. Even if you do fiddle with the lower buckles during transitions, they’re excellent. A ratcheting strap secures my heel into the pocket without crushing the navicular area (this design is similar to what Scarpa has done on the Maestrale and Spirit4 before it, and is one we very much like). Dynafit Hoji Pro Tour — Toe Buckle and Ankle Strap. A simple buckle over the forefoot tightens up the toe box, and it’s reversed to decrease the likelihood of it getting knocked open while scrambling. I tend to keep this on its loosest setting and not mess with it at all while touring. I’m a huge fan of both the ankle strap and lower buckle, and feel like this is a perfect setup for a touring boot. The Hoji Pro Tour’s 11° forward lean is relatively upright — more so than the Maestrale line of boots from Scarpa (both the new and old versions), the Dynafit TLT6 and TLT7. The forward lean of the Hoji Pro Tour feels similar to the Salomon S/Lab X-Alp and Atomic Backland Carbon. Up front, the Hoji Pro Tour features Dynafit’s “Speed Nose” design and their Masterstep fittings. The Speed Nose lacks any sort of toe welt, which means that the pivot point of the tech pins is closer to the foot, allowing for a more natural stride. But as I’ll get into later, the Speed Nose causes some noteworthy disadvantages when it comes to compatibility with bindings and crampons. In the back, the Hoji is equipped with a bolt-through Dynafit Masterstep tech fitting, meaning that it should theoretically be more durable than the heel tech fittings on most other boots that come simply screwed into the plastic of the shell’s heel. The Hoji Pro Tour’s upper powerstrap features the Dynafit cam lock, which I believe should be standard on every boot given how well it holds and releases compared to traditional velcro straps. The lower-end Hoji PX and Hoji PX W features traditional velcro powerstraps. The Hoji Pro Tour’s entire tongue cover pivots forward, which makes getting into and out of the boot very easy, even when the boot is cold. This system is very reminiscent of the old Scarpa Maestrale. However, because the plastic tongue and liner tongue all need to be aligned with the edges of the liner, it can be a bit tricky to get all the different parts lined up correctly. I was wary of snow getting in between all those pieces, but after getting many days in the production boot, I haven’t had any alignment issues whatsoever with the tongue. It’s snowproof and excellent. So, does the Hoji Pro Tour walk well? The Hoji Pro Tour’s 55° of stated range of motion (ROM) delivers a smooth, dextrous ride that’s very close to friction-free. Those used to lighter, more uphill-oriented touring boots (e.g., Atomic Backland Carbon or Salomon S-Lab X-Alp) will find that the Hoji Pro Tour has noticeably less rearward ROM. But for a boot of this weight (and that skis this well — see below), the Hoji Pro Tour walks exceptionally well, and I was able to get over my toes easily while skinning when I wanted to. I personally haven’t been able to get the Hoji Lock system to function as intended while skinning on long uphills. 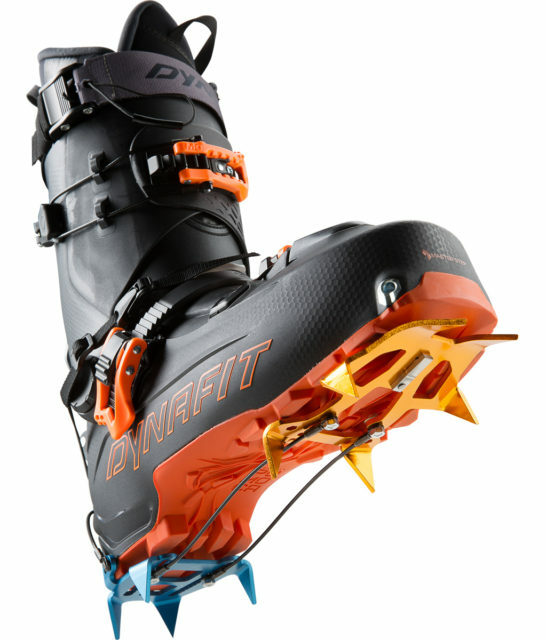 Dynafit makes quite a big deal about touring in the boot with the upper buckle and powerstrap set to downhill tension, then simply flipping the walk lever in the back, which then extends the cables attached to both the upper buckle and powerstrap to achieve the looseness you want for going uphill. They are understandably excited about this because, in theory, it makes transitions quicker and far less finicky. 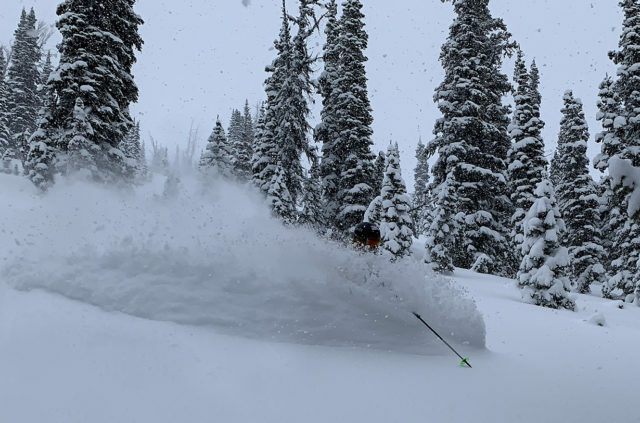 David Steele in the Dynafit Hoji Pro Tour, NW Montana Backcountry. But this hasn’t quite worked for me — the cables actuated by the lever simply didn’t open the upper cuff wide enough to keep my (fairly large) legs and calves comfortable and cramp-free while touring. Cooking liners, messing with buckles, or shifting the tension on the adjustable walk-mechanism lever didn’t fix this — for me, there’s simply not enough overall travel in the mechanism to be “loose enough to tour” on the uphill and “fully locked in” on the down. My local ski area (after it closes for the season) requires 2000 ft of sustained uphill travel to access the backside and (usually) better snow. For a long, sustained skintrack like this, I set the Hoji-Lock lever in walk mode, and then leave the upper strap as loose as possible and don’t buckle the upper cuff at all. These settings left my upper leg free to move, and didn’t lead to cramping. I’ve tried to use the system as designed many times since my initial testing, and every time I revert to fully loosening my upper buckle and power strap. I suspect that folks who have lower legs and calves that are less large than mine will not have this issue. My lower legs and calves are pretty beefy. And since I’ve never been able to tour with the upper cuff even close to cinched on any boot I’ve used, I’d say my legs are probably extra-sensitive to this. Remember when Dynafit said that the Hoji delivers “downhill performance like you get with an alpine ski boot”? Well based on all the time I’ve spent in the boot, I think that statement is accurate. All of my initial days in the Hoji Pro Tour featured strange, gooey, and crusty late-spring conditions, where the snow surface was unconsolidated, refreezing, or punchy. It wasn’t easy skiing, and would have been tricky in a lighter touring boot, especially one with a soft flex. Since then, I’ve skied bumps, groomers, and oodles of backcountry pow. When locked into ski mode, the Hoji is not what I would call a “soft” flex, but it’s also not as stiff as some of the numerous more downhill-oriented touring boots on the market. 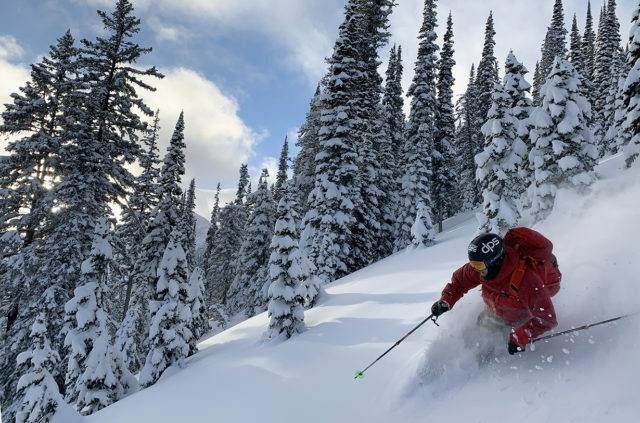 Dynafit has assigned the Hoji Pro Tour a flex rating of 120, and that seems a bit generous given that the Hoji Pro Tour feels just a little stiffer than the Salomon MTN Explore, which has a stated flex of 100 (though we at Blister think that it feels closer to a 110). The Hoji Pro Tour is far, far softer than the Scarpa Freedom RS (which has a stated flex of 130, and is one of the stiffest A/T boots we’ve ever reviewed). And finally, the Hoji Pro Tour is slightly softer than the new Scarpa Maestrale RS (stated flex of 125). But where the Hoji Pro Tour stands apart — especially for a touring boot — is in the progressive nature of its flex pattern. It’s a buttery smooth ramp up — the fairly soft initial flex just gets firmer the more you push into the front of the boot. This makes for a lively, energetic boot that inspires confidence while going fast, jumping off knolls, and skiing hard in challenging conditions. Unlike many touring boots, the Hoji Pro Tour’s flex pattern doesn’t have that (awful) feeling of “hitting a wall,” and then blowing through the flex. So I think it’s fair to say that the downhill power and the progressive nature of the Hoji Pro Tour’s flex is similar to inbounds boots. But in terms of overall stiffness, I think the Hoji Pro Tour is a bit soft for a “120-flex” boot. Binding Compatibility / Hoji Pro Tour as a “50/50” Boot? Given that it tours well and skis well, there is certainly some potential for using the Hoji Pro Tour as a crossover boot for skiing both the resort and the backcountry. However, Dynafit says that the Hoji Pro Tour is only compatible with tech bindings that have traditional pin-style heels, so the Hoji Pro Tour’s back heel welt isn’t designed to be big enough to accomodate a Marker Kingpin or Salomon / Atomic Shift. Fritschi does say that the Hoji boot will work with the Tecton and Vipec Evo, though the Hoji’s “Speed Nose” does limit the Tecton and Vipec’s range of motion while touring compared to boots with traditional toe welts. I think that it’s unfortunate that Dynafit has pigeon-holed the Hoji Pro Tour in this regard, especially given that other similar boots (e.g., Scarpa Maestrale RS, Salomon S/Lab MTN, and Atomic Hawx Ultra XTD) are all fully compatible with a wider range of more downhill-oriented bindings. For those who want an even stiffer boot that is compatible with bindings like the Kingpin and Shift, Dynafit is releasing the 19/20 Hoji Free, which reportedly addresses both of those issues. You can hear more about that boot here. The other issue with the Hoji Pro Tour comes with crampon compatibility. 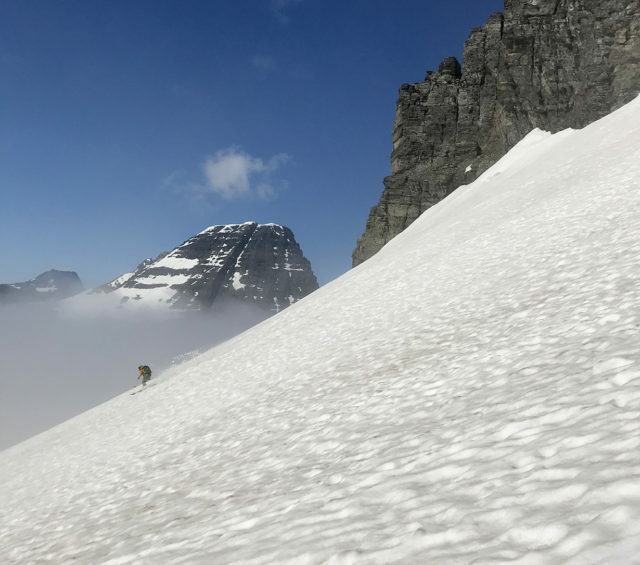 I opted to leave the Hoji Pro Tour behind on a five-day ski traverse on the Wapta Icefield because none of the three pairs of crampons I own (the automatic Black Diamond Sabretooth Pro and the semi-automatic Camp Stalker and Petzl Irvis Hybrid) seemed to fit well on the Speed Nose due to its width and lack of a toe welt. 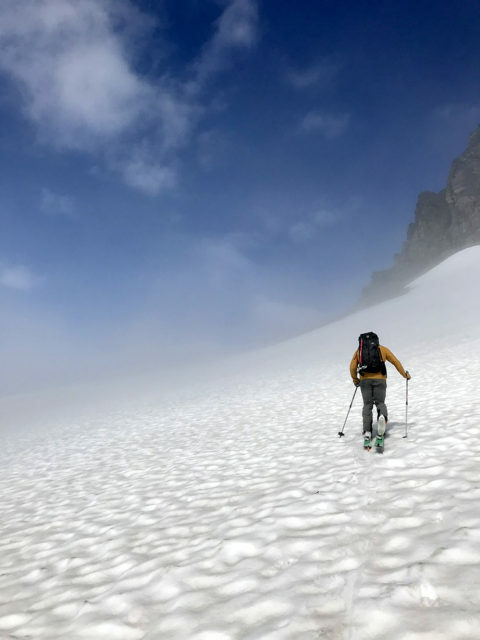 Dynafit does say the Hoji Pro Tour is compatible with most semi-automatic crampons, so there may be options that do work better. But I haven’t been able to get a very secure fit with the crampons mentioned above. Having put thirty days on two sets of boots (four on the first, twenty-six on the second), I’ve found the durability of the Hoji Pro Tour to be quite good. The only issue I’ve yet seen is a bit of shredding in the stitching of the fabric in the upper part of the tongue. My habit of not using the Hoji lock in its standard configuration could be the cause of this. I’ll report back if I notice any further issues down the line. The Hoji Pro Tour walks well, skis well, and has a nice, progressive flex, but it isn’t compatible with more downhill-oriented bindings, so it’s best for skiers who want good uphill and downhill performance but are going to use it with full tech pin setups. The Hoji Pro Tour is stiff enough and progressive enough to ski pretty hard, but it is certainly not among the stiffest touring boots on the market. The other noteworthy feature is the wide last — folks with big feet will likely find the Hoji Pro Tour very comfortable, but people with narrower feet will probably be swimming in it. If you’re looking for a wide touring boot that walks well and has a nice, progressive flex, you don’t require maximum stiffness, and you only ski pin bindings, then the Hoji Pro Tour could be an excellent option. Fingers cross that a more resort compatible version is made. Coming from a place where I have to fly before I can ski I’m not going to take two sets of boots with me and I don’t want to walk for all of my turns. I know I’m therefore not the target audience. I also understand what Hoji wanted to achieve with the binding points being so close to the ball of the foot (after listening to the Blister podcast with him) but I love the high volume design as I often really struggle in this area and do on occasion walk for my turns. Agreed. Anyone taking bets on whether the next version is going to be more friendly to other bindings? Yeah, I ended up buying a pair of the Hoji Pro Tours – too early I’m afraid. Worst thing is, it seems I won’t get to use them for at least another 12 months now. Nor the skis I bought to use with the boots. I haven’t bought skis in many, many years but needed to buy some due to the speed nose… Still, after listening to the last Blister podcast with Hoji (where he talks about the updated model), it sounds like they’re reducing the volume which is unlikely to suit my foot anyway. Walking around my apartment in the boots felt pretty good, and that’s without heat moulding etc which I’ll do once I finally get back to the snow. There’s some confusion here, as Black Diamond claims that the Tecton is compatible, but Dynafit does not officially give their approval for that kind of use. My sense is that if you want to go for it, it’s at your own risk, but I’d prefer to have a heel welt that was designed by the manufacturer to work with the kind of binding I’m using. All the skiing included in this review was done on the preproduction Hoji Pro Tour Limited Edition, although I’ve got the production model on hand and just did a bit of flex testing clicked into a ski on the carpet to double check my assertions here. To me, at 5’8″ and 195, I feel a consistently progressive flex in both the preproduction and production versions (the flex feels exactly the same to me). 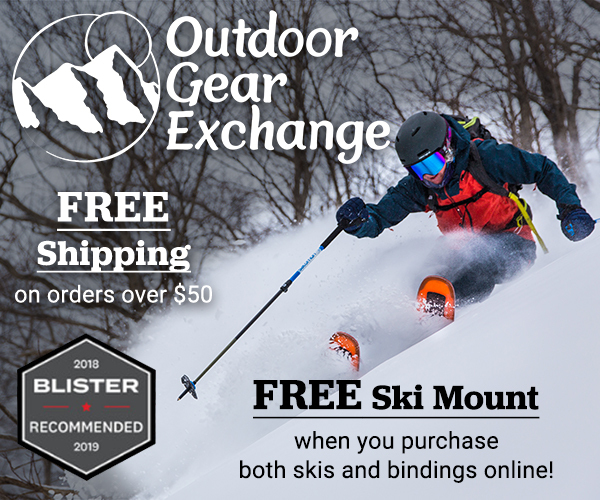 This is especially true compared to many of the light touring boots I’ve used (the Atomic Backland Carbon, Dynafit TLT6 and Speedfit), which tend to either be a concentrated wall that gives out, or a soft flex all the way down, and fits with the flex relative to the MTN Explores and Freedom RS that I have on hand. I’d certainly expect that folks who weigh less than I do may find the boot to be stiffer in flex. I find flexing boots not clicked into a ski to be a dubious process, because I simply can’t lean into them as far as I’d like. I’d definitely agree that the production model feels lower volume around the foot, especially since the liner on the production model has much thicker foam. I’ll be curious (and hopeful) that it gains a lot of volume there after cooking it, since that’s what my hobbit feet like. Hey David, thanks for an informative article. I have a couple of questions. First, if you’ve tried it, how do you think the flex of the Hoji compares to the Hawx 130? I just tried the Hoji on in the shop, and I kind of thought it might have felt stiffer than I remember the Hawx being. Second, having fiddled with the cable walk system a bit, does the durability of it worry you at all? When I switched it into ski mode, I was imagining popping a cable on the top of some steep couloir or deep in the backcountry, which of course would be about the last thing you’d want. Thanks! Funny thing. This boot changed every thing I know about boots. My alpine boot is a tecnica mach 1 130 lv with zip fit gara liners. Bought a pair of the pre production hoji boots from backcountry. Put intuition pro tour liners and had custom insoles made for them. I have a hard time distinguishing the performance between the two. Have a pair of moment 184 bibby pros mounted with g3 ion 12’s and a pair of 190 moment bibby pros mounted with look pivots. In most conditions they ski the same. A little better in cut up snow with the alpine set up maybe just a tad more stable. Put the tecnica’s on one foot and the hoji’s on the other, could have skied them that way! Same forward lean, same flex. Granted neither had a stock liner. Not sure about stated flex or lean, just my opinion after skiing both. Thought tecnica mach 1 lv 130 with zipfit gara liners couldn’t get much better but this boot just blows me away. granted the pre production liner sucked, but with the intuition pro tours skis awesome. I have recently had a few issues with the boot that I was wondering if others had experienced. 1) Because of the speed toe in no longer straps on the full dynafit ski crampons and the most important tooth does not get pushed into the snow surface. 2) Snow build up from from skiing on the toe, triggers the binding release when quickly maeuvered on kick turns since the speed toe full articulated forward has almost zero breathing room from the release. Hit me back if you have had theses issues. I am tempted to move on after only a month. Can anyone speak to the volume and instep height compared to the TLT7? I’ve been having some pressure issues on the top of my foot and was hoping that the Hoji would be a solution. I tried on the Dynafit Hoji Pro Tour Women’s boot yesterday. It felt comfortable. I’m concerned about the 11 degree forward lean. This seems really low. How does it affect the downhill performance and comfort position for downhill?